Nelson Mandela’s 90th birthday party celebration takes place at Hyde Park in the center of London England on June 27th 2008. According to unconfirmed reports, Eminem is set to perform as the headline act. Also rumoured is the host of Nelson Mandela’s birthday party celebration being none other than Mr.Will Smith who has hosted previous Nelson Mandela 46664 music concerts. Originally it was announced that The Spice Girls were going to be headlining Mandela’s Birthday bash as he was reported to have a deep admiration for the popular girl band. Although Eminem has been out of the public limelight for some time now after announcing his retirement in 2005 he has apparently been working on some possible new material for a new album. “We’re amazed to have Eminem on board. We wanted some of the greatest artists from recent times and Eminem was on the list.” – quoted from an inside event organiser. 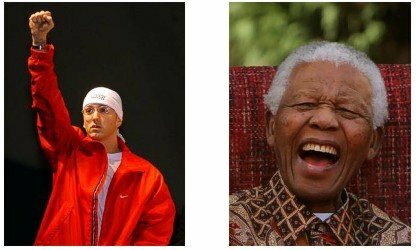 If it turns out to be true that Eminem will be joining Nelson Mandela on stage at his 90th Birthday Party Celebration then the rapper will be performing along side other stars such as Stevie Wonder, Annie Lennox, Keane and Razorlight to name a few.